Mashovhela Lodge - Makhado (Louis Trichardt) Accommodation. Enjoy the unique atmosphere of Mashovhela Lodge in Morning Sun Nature Reserve, tucked away in a steep valley, surrounded by impressive rocky outcrops where Black Eagles nest. 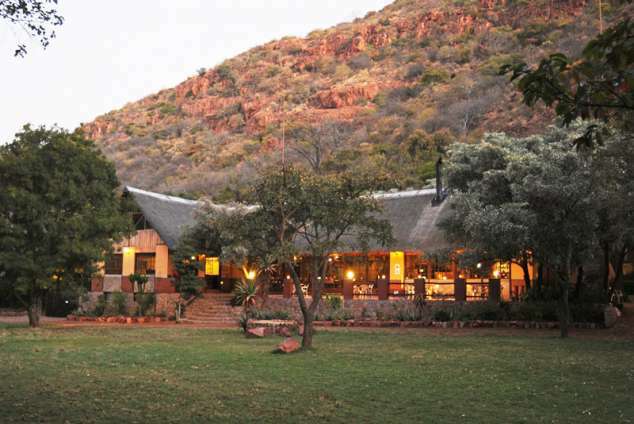 This Natural Heritage Site is situated in the scenic, malaria free Soutpansberg Mountains. Be revitalized by the natural beauty and the Venda culture of dance, drums, secret forests and lakes, unique mythology and the magic of the sacred Mashovhela rock pool, "Place where the drums beat". Let our warm and friendly staff pamper you whilst you relax in our cozy Venda style lodge, which is recognized for its eco-friendly principles, sustainable energy usage at an affordable rate. Our 10 intimate en-suite chalets have a unique ethnic feel, whilst offering complete comfort and privacy. Children are accommodated in our family friendly units. The call of bush babies and the hooting of Owls will break the silence of the night whilst you stretch out on our luxurious "king size" or twin beds. From your own private veranda surrounded by "magube" walls you can enjoy a cocktail, whilst watching the Black Eagles returning to their nest. Our excellent service and warm atmosphere is culturally inspired and will make the dining experiences a special occasion to remember. The restaurant, terrace, boma and even the bush, as well as the fully licensed bar guarantees not only variations in food, fine South African wines, cocktails or a drink of your choice, but a different setting for various occasions. The memorable dinners start as the sunsets and the drums call you to our African boma to join in a Venda dance to honour the chef for the creative and delicious meal to be served. Be one of the few to enjoy the solitude of 4000 ha (10 000 acres) of untouched bush in this eco-friendly environment. Explore and discover the natural beauty and wonders of this natural heritage site. From the spectacular scenic Soutpansberg Mountains and valleys, streams and rock pools, diverse wildlife and plant species to past cultural mythology. Walk freely through the reserve and study the diversity of plants and trees, variety of antelope and other mammals, and the abundance of birds. Join our resident Venda guide who will share his knowledge of this intricate ecosystem and share stories of his people and their use of nature in a sustainable and responsible manner for medicines and food. According to Venda tradition King Thohoiyanda mysteriously disappeared with his sacred drum. Neither were ever seen again. Legend has it that the drum can sometimes be heard in the echoes of the cliffs surrounding Mashovhela pool. Listen for the beat of King Thohoiyanda's drum at Mashovhela rock pool, the second most sacred place in Venda folklore. Venture into silent mystical indigenous forests and to hidden lakes of Venda not general advertised to tourists with our registered Venda guide. GPS Coordinates: Gate: S: 22° 56' 53.8" E: 029° 55' 27.4"
25770 page views since 14 Aug, 2008. Last updated on 29 Aug, 2018.